The story of The Alexandra Palace Theatre is truly unique. Opened in 1875, the Theatre was a place of spectacle and delight where audiences of up to 3,000 people were entertained by pantomime, opera, drama and ballet. A feat of Victorian engineering, the impressive stage machinery was designed so that performers could appear, fly into the air and disappear through the stage. However, it struggled to compete with the might of the West End and the theatre went on to be used as a cinema, a chapel and the home of music hall stars before a spell as a BBC prop store and workshop. For 80 years it has been closed to the public, a hidden gem perched high above the city. Age Restrictions: Children under the age of 4 are not permitted. It’s a celebration of Christmas in the most wonderful, wildly funny and moving way you’ll ever see! Horrible Histories proudly presents the terrific tale of Christmas in the triumphant re-opening of Alexandra Palace. When Christmas comes under threat from a jolly man dressed in red, it’s up to one young boy to save the day – but can he save Christmas? 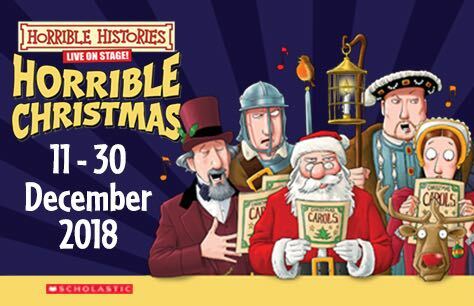 From Victorian villains to Medieval monks, Puritan parties to Tudor treats, join us on a hair-raising adventure through the history of Christmas in the company of Charles Dickens, Oliver Cromwell, King Henry VIII, St Nicholas and Rudolph the Red Nosed Reindeer as they all join forces to save the festive season! It’s a celebration of Christmas in the most wonderful, wildly funny and moving way you’ll ever see!